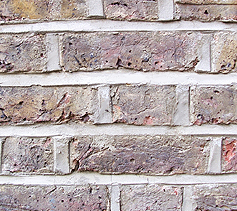 The mortar(mortar is sand and cement mixed with water) between brickwork will tend to crumble and fall out over long periods of time. Have a look at yours. 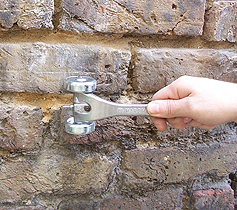 If there is some missing or if it comes away or crumbles if you dig at it with a scraper then you need to re-point the bricks Left like this it will only get worse and you may be getting dampness coming into the house. Re pointing is fairly straightforward but is a quite messy and very laborious job. Large areas will take quite some time. Alternatively you can buy a special mortar rake. A hand operated rake is easy to use and costs around £10. If you've got a lot of mortar to rake out using power tools may help. Using power tools is even more of a dusty messy job. Ensure you are wearing adequate protection. Dust mask, goggles etc. If you hire a professional system it may come with a dust extraction system. Remove the old mortar with on of the above methods. Pictured right I am using a hand mortar rake. 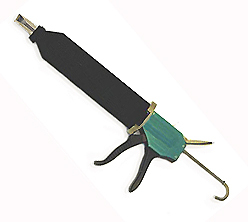 The adjustable length hardened steel nail digs in to the old soft mortar as you drag it along. 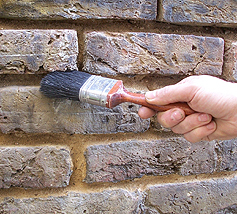 This method works well and there is little risk of damaging the brickwork which you may find with some power tools. After removing the old mortar clean out all the loose dust with a paint brush. Then prior to reappointing dampen the area with a water spay or wet brush. This will stop the brickwork absorbing too much water from the mortar as it dries. 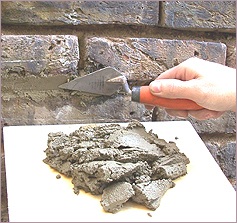 Mix up a small amount of pointing mortar. 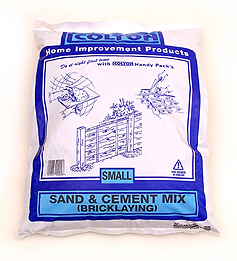 Rather than buy a bag of sand and a bag of cement, for small jobs, I find it much easier to buy a ready mixed mortar mix. You don't have to worry about getting quantities of the sand cement mix right. Just add water as directed. I should end up as a very thick creamy mix. Next comes the laborious bit. Load some of your cement mix on to a pointing hawk. A pointing hawk is simply a flat surface with a handle underneath. (also used when plastering internal walls). You can buy one for around £10 or simply make one out of some thin scrap wood. With a small pointing trowel force the mortar between the brickwork. This can be messy. Try to avoid getting too much mortar on the bricks. Smooth it of afterwards for a flush finish. When partially dry use an old brush to brush of any mortar residue from the bricks.